This online story is a slightly expanded and modified version of the story that appeared in the print issue. Mineral Resource of the Month returns next month. Northern Peru has an exceptionally rich archaeological heritage that includes metalwork, ceramics and textiles. The success of at least a half-dozen pre-Columbian societies dating back 3,000 years and subsequent Spanish colonization in the 1400s has rested on the effective use of northern Perus abundant resources. In the summer of 2000, my son Matt and I learned about that connection firsthand by volunteering at the Santa Rita B archaeological site in the Chao Valley near Trujillo in northern Peru. Riding donkey-back through the Andes and talking with local people, we got our hands dirty in the rich archaeology and geology of the area. We were able to correlate mineral occurrences to their various roles in society  opening a window into the regions fascinating past. From construction to metallurgy, pre-Columbian societies flourished and advanced because of their understanding and use of the available mineral resources. Although recent mining activity over the past few years has overprinted evidence of pre-Columbian mining, several features we observed at a small copper mine near Santa Rita B indicate the many-thousand year history of mining in the area. Adits (tunnels) in the mine have undulating walls, originally opened by firesetting  an ancient mining technique in which miners set a fire adjacent to the face and then threw cold water on the hot surface to make the rock shatter and facilitate excavation of the ore with bone or stone tools. Also, the floor of the adit slopes downward approximately 30 degrees, representing a style of excavation, not used today, known as medio barreto. The adits are only 3 to 4 meters in length because pre-Columbian miners rarely penetrated beyond the distance where the sun would easily illuminate the adit. On a flat area nearby, we saw 20- to 30-centimeter-high stone foundations that outline three 4-by-6-meter structures that were workshops or living quarters for the miners. We identified several ground sluices (water passages) carved into the slope of the hills near the mine  artifacts of an antique method of mineral separation. Abundant thick-walled ceramic fragments also signaled that this was a pre-Columbian work site. Tumbaga is the archaeological term that describes an alloy of gold, copper and silver crafted in pre-Columbian workshops that ultimately fed the Spanish passion for metals in the 1600s. Some of the metals used in Peru came from local sources, while others, based on our geological field work, may have come from a distance. A Spanish colonial adobe smelter in the Chao Valley in northern Peru marks a time of great Spanish interest in metals in the area. Photo by William Brooks. Copper was perhaps the most widely used metal in pre-Columbian cultures, used for everything from jewelry and tweezers to foils and small tumis, or knives. Ores from Andean porphyry copper systems may also contain gold and silver. Copper is abundant in Peru; a few major porphyry copper deposits include Antamina, Cerro Verde and Tintaya. On a smaller scale, copper occurs near Santa Rita B, with a small copper mine less than 2 kilometers south of the site. We found shallow adits and veins containing hematite, goethite, manganese oxides and quartz in the oxidized cap. We also found loose chunks of chrysocolla, locally cardinillo, an ore of copper valued by pre-Columbian civilizations for use in jewelry because of its blue-green color. The major source of pre-Columbian gold appears to have been alluvial, which may also have contained silver. Alluvial, or placer gold, is abundant and easy to mine, and when alloyed with copper has a lower melting temperature. Its malleability permitted minimal preparation before crafting. Today, northern Peru hosts two of the countrys three major areas of alluvial gold production; abundant goldwork items correlate with these areas of abundant placer gold. Of Perus 14 gold-producing districts, the Pataz district in northern Peru is known to have produced the precious metal from gold-quartz-pyrite veins since pre-Columbian times. This district also has the largest historical production of gold in Peru. Some goldwork objects and mask and craft decorations contain platinum nodules. Both metals have similarly high specific gravity. Gold-platinum alluvial occurrences exist in Columbia, Bolivia, Ecuador and Peru. Because of platinums brittleness and high melting point, the Spaniards who colonized the area discarded platinum artifacts in favor of the tumbaga artifacts that could easily be melted and returned to Spain. While silver occurrences are numerous throughout the Andes, no evidence exists for silver mining in the Chao Valley. Polymetallic veins with copper, lead and silver are abundant near Santa Rita B; but the absence of lead artifacts, slag and wind furnaces for smelting argentiferous galena indicate that their silver must not have come from a local source. We found a large Spanish colonial adobe-walled smelter, indicating Spanish interest in metals in the area; however we found no ore minerals or tailings at the site. Pre-Columbian miners used mercury to mix with gold flakes, creating a paste that they applied to copper objects and then heated to volatize the mercury  leaving a thin layer of gold on the object. Even then, the Inca recognized the toxic effects of mercury fumes and mining, as recorded by a half-Spanish, half-Inca scholar named Garcilaso de la Vega in the 1500s. The pre-Columbians also used cinnabar as a pigment, as a cosmetic to indicate social status and as decoration on funeral masks. Archaeologists think that pre-Columbian societies used charcoal, dung and plant material as their main fuel sources; however, the geology of the region indicates the availability of coal in northern Peru. The Northern Anthracite Field, also known as the Alto Chicama (which means coal in Quechua), is the most extensive and well known coal province in Peru. Coal is mined today on a small scale at La Victoria and Banos de Chimu, with the coal burned for domestic use or processed into briquettes for use in small, unvented coal burners in rural areas. The largest and most well known Peruvian coal mines, Goyllarisquisga and Callacuyan, however, are closed. But pre-Columbians knew about coal and used it for mirrors, metallurgy, beads and cremation. Sea coal, available today on some of the beaches of northern Peru, may have provided another source of coal to ancient people. Guano, deposited by sea birds on numerous islands along the coast of Peru, provided fertilizer for the agricultural needs and regional expansion of pre-Columbian society. The guano beds were as thick as 40 meters, with pre-Columbian metal and wood as well as Spanish colonial artifacts found in the some of the deposits. Of the organic fertilizers, Peruvian guano is exceptionally rich in nitrogen, phosphate and potash. These nutrients stimulated the growth of cotton that was dyed and woven to become part of the archaeological richness of northern Peru. I was surprised to see that reed boats or caballitos de totora, are still used today on the beaches of northern Peru. This style of boat, depicted in pre-Columbian drawings, transported the guano to the coast for agricultural use. Peruvian guano was an important commodity and was exported to Europe during the 19th century. Altered volcanic rock associated with porphyry intrusions provided fine-grained clay as an industrial material for making stirrup pots and figure molds for metal casting; it was even fashioned into flutes and horns. The pre-Columbians may have used coal to fire some of the ceramics and used white clay to make a final creamy coating, or slip, for ceramic decoration. 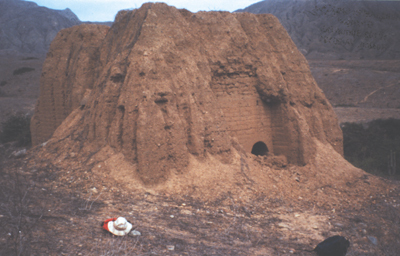 River clay and silt, mixed with straw and shell fragments, provided another industrial material to make adobe bricks, used to build temples and walled cities such as Chan Chan. Hematite, limonite and manganese oxides, also sourced from these areas, were used as pigments to decorate ceramics and murals. Manganese oxide was a preferred resource for mummy preparation in parts of the pre-Columbian world. Obsidian, attached to sticks with bitumen, was fashioned into surgical instruments or was used for ritual defleshing. A mummy skull in the Gold Museum in Lima has a gold plate that was surgically implanted in the skull premortem. The shell of Spondylus, a spiny, coral-colored oyster, was valued for jewelry and its possession indicated social status because it could only be obtained from deeper waters off the coast of Ecuador. Bitumen, found in northern Peru, near Talara, had uses as cement for dimension stone, as a setting for gold, and as a glue to attach arrowheads and secure Spondylus shell fragments as decoration on wooden figures. The Spaniards used bitumen to caulk ships, waterproof rigging, or seal wine bottles. These reed boats on a beach near Trujillo off the coast of Peru once transported guano and are now used for fishing. Photo by William Brooks. Pre-Columbian construction workers selectively used rounded river cobbles, 20 to 30 centimeters in diameter, in the construction of dams and irrigation canals, as hammer stones to finish dimension stone or process ore, and to grind grain. Rounded pebbles, 1 to 2 centimeters in diameter, were stockpiled and used as sling-stones. The workers preferred angular cobbles, however, for domestic walls at Santa Rita B. While exploring the regions geology, I gained a vast and rich understanding of the importance of mineral resources in pre-Columbian society. Research into the role of mineral occurrences in the growth of ancient societies is an exciting field that combines geology and archaeology and promises further discoveries. William E. Brooks is a geologist and mineral commodities specialist with the U.S. Geological Survey in Reston, Va., and has extensive mapping and exploration experience in Latin America. He will be a co-convener of Utilization of Geologic Resources by Ancient Civilizations, a topical session at the Northeast/Southeast combined section meeting of the Geological Society of America in spring 2004.